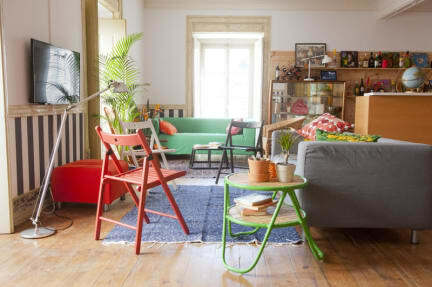 Atlas Hostel is a brand new accommodation and bar in the historical centre of Leiria. The property has a cool and friendly environment, and you can enjoy a great view of the Medieval Castle from the sunny terrace. Atlas Hostel features free WiFi, a ping-pong and a barbecue. There is a shared kitchen and living room. Atlas Hostel is very well-located in the heart of the historical centre of Leiria. It is just a two-minute walk from the Mediaeval Castle and it is surrounded by lots of cafes, restaurants and pubs. The property is as well located close to Dr. Magalhães Pessoa Stadium. All rooms are well-equipped and maintained. Each room comes with a shared bathroom. Check-in time is from 12 am to 12 pm. Cancellation policy: 24 hour before arrival. design hostel accommodation, we booked Atlas hostel where we checked in but we stayed in a separate building called La Palma hostel, beautiful common areas and swimming pool! Thank you for everything guys! Staff was great! FREE COCKTAIL to all guests!! A big fancy one, too. I had to print some documents, they helped me for free, so kind. The neighborhood this hostel is in is beautiful, and the locals hang out at the hostel bar because it's so great. Stay here! Excellent hostel that has a bar upstairs and many living rooms to relax and is in a great location for nightlife. It's safe, clean and the staff are really friendly. I would highly recommend this hostel. A good value for money stay at this hostel. Staff were friendly and helpful. I was directed by this new staff, Jacques (if I recalled it right) to a new hostel which is part of Atlas Hostel. It is new, clean, spacious and well-decorated. 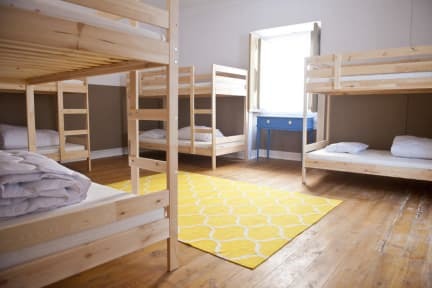 Located in the heart of the historic centre and close to the bus station, the hostel has superb facilities, a swimming pool and good atmosphere. Toilets and washrooms are very clean and spacious. I would recommend this hostel to anyone who visits Leiria. Great location. The hostel is clean and bright, and in a really nice building. The staff was really sweet and helpful. The bathrooms are downstairs from the bedrooms, so be prepared for that. The hostel runs a bar which is loud and crowded until around 2:00 am every night. If you want to sleep before the bar settles down, you will need ear plugs. We absolutely loved Atlas hostel, the atmosphere is amazing and the staff is very helpful. It has a lot of common space where you can hang out with new people you meet. The Hostel is great. Nice building, perfect location, great staff, good beds/ rooms. Showerfloor needs better clean. I was unlucky with my roommates (had only 2). They were coming in the room after midnight turning on the big light. and making lots of noise The guy(i guess a moslim) had an 'Allah Akbar' wake up tune on his phone around five in the morning, some time later another tune. The girl's alarm went off at 7.00 and 7.10 and 7.20 and 7.30 and than i told her to get out or turn it off.